An advocacy group, led by RenewableUK and Scottish Renewables, has been launched by industry body RenewableUK to make the case for large-scale deployment of floating wind power off Britain. The group includes representatives from developers and supply chain companies, and from regions around the UK. Following their Cost of Energy Review, the Department for Business, Energy and Industrial Strategy is currently developing a White Paper which will update the Government’s electricity strategy. The floating offshore wind industry is looking for the White Paper to recognise the opportunity for the UK to pioneer new technology and industrial opportunities for our regions. Floating offshore wind was mentioned in the Offshore Wind Sector Deal, and the industry recognises that new technology will be valuable in helping the Government reach 50GW of offshore wind generation by 2050. The vast majority of offshore wind in the UK has been installed using foundations fixed directly to the seabed, which are easily installed in shallower waters. The world’s first floating offshore wind farm, the 30MW Hywind project, was opened by Equinor and Masdar off the coast of Peterhead in late 2017. 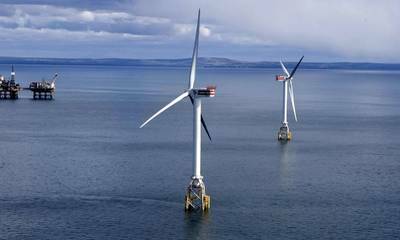 Since then, the first turbine has been installed at the Kincardine floating wind farm off the coast of Aberdeenshire, which will have a capacity of 50MW when fully constructed. The UK’s existing leadership in offshore energy, and our abundant natural resources makes our waters the ideal test bed for this new technology, which has huge international potential as other countries seek to take advantage of the renewables boom.